BakerCreekSeeds | October 11, 2010 | Scott Chaskey is president of NOFA, NY, and Quail Hill farm. A wonderful organic farm on a land trust on Long Island. Learn about its produce, contribution to sustainable small farming methods. With Paul Wallace of the Petaluma Seed Bank. nicholasschoolatduke | September 22, 2010 | Toby Hemenway is a frequent teacher, consultant, and lecturer on permaculture and ecological design throughout the U.S. and other countries. 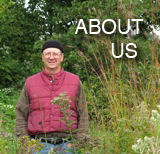 His writing has appeared in magazines such as Natural Home, Whole Earth Review and American Gardener. He is an adjunct professor in the School of Graduate Education at Portland State University, a scholar-in-residence at Pacific University, and a biologist consultant for the Biomimicry Guild.